Jiu-jitsu.News: Ukrainian fighter won gold in the USA! Ukrainian fighter won gold in the USA! 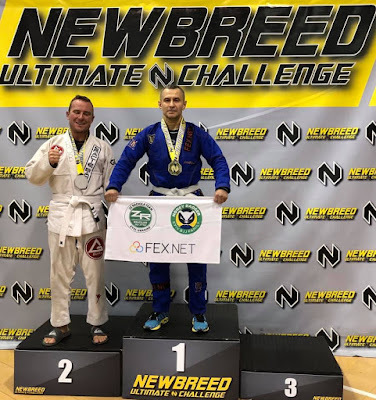 The impressive BJJ tournament “Newbreed Ultimate Challenge” was held in Jacksonville, Florida, USA, on January 26. A lot of talented fighters from different parts of the world impressed the audience with a high level of BJJ technique and showed decent fights. The best fighters received worthy awards. Ukrainian sportsman also received deserved gold! Alexander Kostyuk fought in the featherweight division in the adult category and defeated his rival Robert Ulerick from “Gracie Barra” team, USA. It must be noted, Alexander was the only representative of the “ZR Team” at the tournament! Ukrainian fighter has once again proved that BJJ sportsmen from Ukraine have the highest level of skills! The new BJJ league was created in Ukraine!